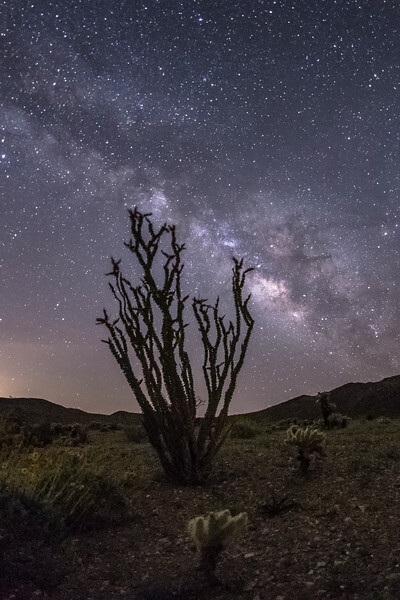 The Milky Way passing through an ocotillo in Jojoba Wash in the southern part of Anza-Borrego Desert State Park. The ocotillo is slightly blurry due to it being quite windy this night. For this frame, the wind slowed down a bit, fortunately. I shot this at 4:39 AM with a Canon 6D and Sigma 15mm EX DG at 25 sec f/2.8 ISO 4000. This is a vertical crop of a single frame from a time lapse I shot here. I'll be posting the time lapse video in the near future.